Most women want to combine class with style and comfort. You can manage to do that with a pair of skinny jeans, a sequin silver top, a white blazer and pointy white high heels. 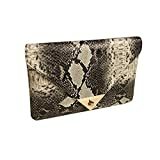 A snakeskin clutch bag completes in style with pants.